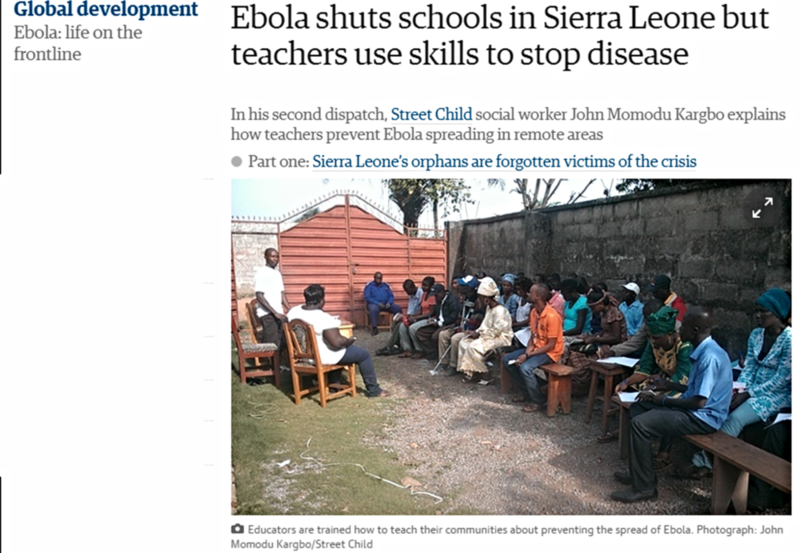 Alongside Street Child's flagship Ebola Orphan work, the other vital strand of Street Child's Ebola Crisis response is educating Sierra Leoneans about what Ebola is and how to avoid it - especially those in remote, traditional communities, where general education levels are lowest. Street Child now has 2,000 of these educators on the ground. In his second dispatch for the Guardian, published yesterday, Street Child's rural projects Director, John Momodu Kargbo (known to all as 'JMK') talks about the realities of this process - and the impact he feels it is having. It is a brilliant insight into the realities of this vital work - click here to read the article in full.